A U.S. soldier simply wanted to serve the United States while keeping the articles of his Sikh faith — a turban and beard. But for Bronze Star recipient Major Kamal Kalsi, it took 50 congressional signatures and 15,000 petitioners in a letter to the defense secretary to obtain a religious accommodation in 2009. "It's been a very, very long road and this is a significant step forward," Kalsi said Friday, just days after the U.S. Army announced a new policy that makes it easier for Sikhs, Muslims and other Americans to serve without having to choose between their faith and their country. Army Secretary Eric Fanning issued the directive this week allowing for religious accommodations such as beards, turbans and hijabs to be granted at the brigade level instead of at the secretary level, which has been the case for years. And those who receive religious accommodations will no longer have to keep applying for temporary waivers in order to keep turbans, beards or hijabs while they serve. Instead, Fanning noted the religious accommodations "will continue throughout the soldiers' careers. Such accommodations may not be permanently revoked or modified unless authorized by me or my designee." — World's fifth-largest religion with more than 25 million followers. — Originated in Punjab, India, more than 500 years ago. — Monotheistic religion begun by Guru Nanak, the first prophet; nine gurus (enlighteners) have followed. — Articles of faith include unshorn hair (kesh) to symbolize harmony with God, steel bracelet (kara), ceremonial dagger (kirpan), small comb (kanga) and kachera (soldier shorts). — Turbans worn as commitment to faith. — Belief in working for absolute equality, promoting social welfare and fighting against injustice as sacred duties. The decision to change years of existing policy is "based on the successful examples of soldiers currently serving with these accommodations," he said. Kalsi, an emergency physician, is one of those service members. He received a Bronze Star after his deployment in Afghanistan's Helmand province in 2011, where he treated dozens of fellow soldiers and civilians wounded in fighting. "Secretary Fanning has taken a significant step forward for religious freedom and diversity," Kalsi said. "This is not just for Sikhs, this is a fight for all Americans who believe in diversity and religious freedom." The road to inclusion was not a short or easy one for Kalsi and about 12 other U.S. soldiers who received temporary religious accommodations after filing legal claims against the U.S. Department of Defense. Eric Baxter of the Becket Fund for Religious Liberty, a nonprofit group that protects freedom of religion, was co-counsel on some of the cases. He recalled how, in some instances, soldiers who had completed the lengthy application process had to wait a year or more just to get their initial reviews completed. The lengthy wait time put them close to missing their report dates for basic training. "When we got accommodations, it would be an accommodation just through basic training, so you can imagine a young solder thinking, 'OK, I am going to commit my life for this 10-week period to go through basic training and not even know if I am going to be able to serve my country afterward,' " Baxter said. The January 3 memorandum includes language that not only makes accommodations permanent but also strongly encourages brigade commanders to grant religious accommodations unless there are extraordinary circumstances. Attorney Amandeep Sidhu with McDermott Will and Emery, an international law firm based in Chicago, has represented Sikh service members along with co-counsel for the Sikh Coalition and the Becket Fund for Religious Liberty. "At the most fundamental level, this is the most significant expansion of access to religious accommodation that the Army or any other branch has put forth in over 30 years," Sidhu said Friday. FILE - U.S. Army Capt. 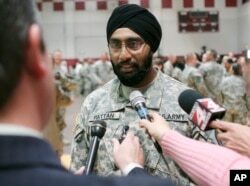 Tejdeep Singh Rattan speaks to journalists at a U.S. Army officer basic training graduation ceremony at Fort Sam Houston in San Antonio, March 22, 2010. Rattan was the first Sikh allowed to complete officer basic training while wearing the traditional turban and full beard since the Army altered the dress code, which had made exceptions for Sikh soldiers, in 1984. For years, Sikh and other service members had to display "proof of concept" to the Army that keeping their turbans and beards had no effect on unit readiness, cohesion and morale, and met health and safety standards. Sidhu noted the new policy makes this clear for the first time. He added the directive would most likely ease the way for new recruits who otherwise felt they would have to choose between observing the tenets of their faith and serving their country. "I expect we will have a large influx of young individuals who finally feel like they can do this," Sidhu said. "Our message to the community will be loud and clear that the door is now open and we should take every opportunity to serve our country." FILE - U.S. Army Spc. 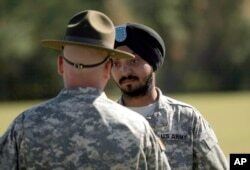 Simran Lamba, right, speaks to his drill sergeant following his graduation from basic combat training at Fort Jackson, S.C., Nov. 10, 2010. Lamba was the first enlisted soldier to be granted a religious accommodation for his Sikh articles of faith since 1984. Sikhs with turbans and beards served in the American military for decades without issue, prior to grooming standards that went into effect in the 1980s. "During World Wars I and II, 80,000 Sikh soldiers died serving alongside allied forces. Those 80,000 soldiers did not have to get an accommodation to serve.They died, they gave their blood, sweat and tears so that we can be free today," Kalsi said. He and Baxter noted the countless number of Sikhs who serve without restrictions in countries such as Britain, India, Australia and Canada, where Defense Secretary Harjit Sajjan is Sikh and wears a turban. "The day when a Sikh solider or any other religious observer can walk up to a recruiter and be admitted into the Army without any kind of process, that will really be the ultimate victory," Baxter said. For now, the hope is that other branches of the U.S. military follow suit in making it easier for those who may feel torn between their religion and service to their country.